I found this spectacular Yellow Antler Coral mushoom today along the Ives Trail, a pleasant place to hike in the forest a few miles from my house. 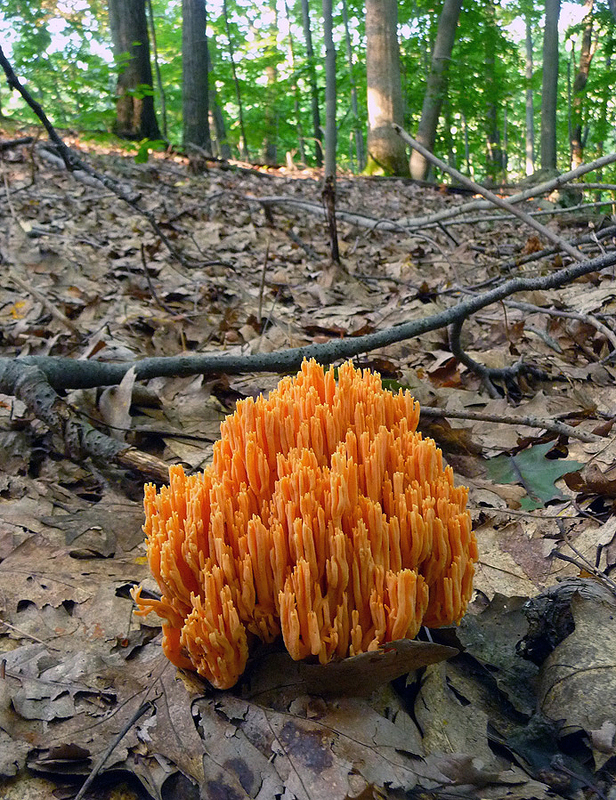 Some sources say that the fungus is edible but has a mealy, bitter taste; others call it inedible. The Yellow Antler Coral's Latin name, Clavulinopsis corniculata, prompts this comment by amateur mycologist Michael Kuo at MushroomExpert.com: "As an English teacher I am tempted to digress on the rolling dactyls and anapests in 'Clavulinopsis corniculata,' with scansion identical to Whitman's 'Out of the cradle, endlessly rocking,' but I'm pretty sure no one cares." Actually, I care—but perhaps that's only because my degree is in English literature and years ago I published a few poems. I also enjoy diagramming sentences and debating the fine points of punctuation and capitalization. A former boss once threw a lamp at me during an argument over a hyphen. Kuo's remark also reminds me of an unforgettable observation by my friend and writing mentor S. Leonard Rubinstein: "Why is it that the names of flowers are as beautiful as the flowers themselves?" . to tell me your favorite picture and caption from the July links below. I'll report the winner tomorrow.